Sabah Tea Garden offers a wonderful dining experience at the Tea House. Be sure to ask for the Tea House specialties including Butter Prawns, Pandan Teh Tarik and the one-of-a-kind Tea Pancakes! A spacious cultural hall where you can enjoy cultural performances and to cater to your group activities and company meetings, Chooseto stay at the Cottages or traditional longhouses. No visit would be complete without a quick stop at the souvenir shop. Bring home and brew your own pot of Sabah Tea today! Ideal as souvenirs and gifts. Just an hour‘s drive from Kinabalu Park, Sabah Tea Garden is located along the main Kota Kinabalu Sandakan road. Drive past the Kundasang War Memorial and the vegetable market. Sabah Tea Garden is located 15-minutes away past the Poring Hot Spring Junction, Signboards will guide you along the way. Sloping hills, dipping valleys and a sea of green as far as the eye can see... Immerse yourself in the lush surroundings of Sabah Tea Garden a 2 1/2 hours drive from Kota Kinabalu. Located conveniently between Kota Kinabalu and Sandakan, this is the perfect pit-stop to relax and unwind before you continue your road trip. This is where you will find Sabah‘s finest tea, harvested with care, processed with precision and brewed for your pleasure. 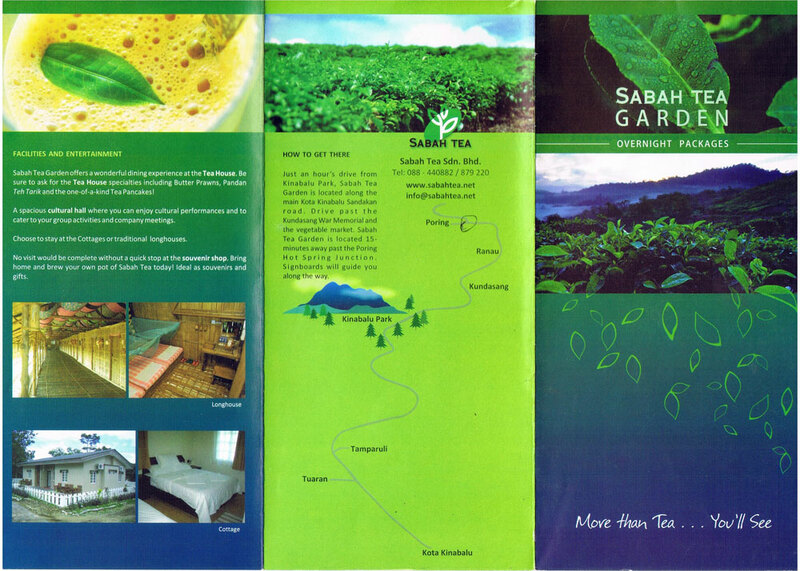 Be it a corporate meeting, a school trip or Just a getaway for family and friends, Sabah Tea Garden is the ideal venue. The guided package includes obstacle-training, team-building, survival-cooking and river knowledge activities at the Sapaon Recreational Area. On the second day, explore the challenging trail of Kamunsu Hill, a 2-hour trek through the Bornean rainforest. Tea factory tour included. Accommodation: Triple-sharing rooms at Sabah Tea Longhouse. Minimum 15pax per group. Mount Kinabalu. 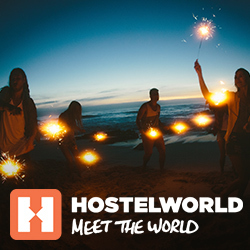 Accommodation: Longhouses or Cottages.Minimum 4 pax per group. 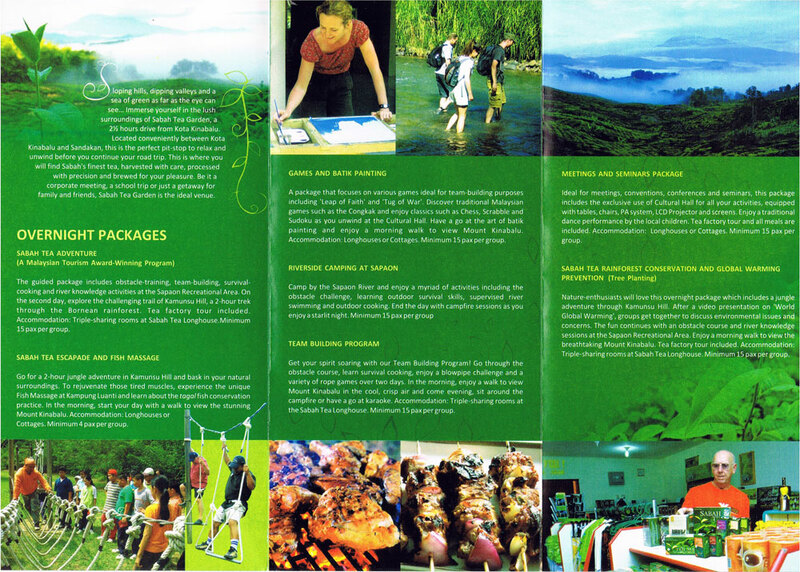 A package that focuses on various games ideal for teambuilding purposes including Leap of Faith‘ and Tug of War. Discover traditional Malaysian garnes such as the Congkak and enjoy classics such as Chess, Scrabble and Sudoku as you unwind at the Cultural Hall. Have a go at the art of batik painting and enjoy a morning walk to view Mount Kinabalu. Accommodation: Longhouses or Cottages. Minimum 15 pax pergroup. campfire or have a go at karaoke. Accommodation: Triple-sharing rooms at the Sabah Tea Longhouse. Minimum 15 pax per group. Ideal for meetings, conventions, conferences and seminars, this package includes the exclusive use of Cultural Hall for all your activities, equipped with tables, chairs, PA System, LCD Projector and screens. Enjoy a traditional dance performance by the local children. Tea factory tour and all meals are included. Accommodation: Longhouses or Cottages. Minimum 15 pax per group. sessions at the Sapaon Recreational Area. Enjoy a morning walk to view the breathtaking Mount Kinabalu. Tea factory tour included. Accommodation: Triple-sharing rooms at Sabah Tea Longhouse. Minimum 15 pax per group.